The fascination with diamonds isn’t a modern phenomenon. The history of diamonds is entwined with the history of the world. Pliny, a Roman naturalist in the first century AD, described diamond as “…the most valuable, not only of precious stones, but of all the things in this world.” One of the first things most people learn about diamonds is that every diamond is unique. Diamonds come in many sizes, shapes, and colors, and with a variety of internal and surface characteristics. What makes diamonds so special? Different people have different answers to that question. A research scientist might say it’s the conditions under which diamonds form in the earth. An economist might say it’s their rarity. A consumer might say it’s their association with love and beauty. And they’d all be right. The natural world is commonly divided into three kingdoms: animal, plant, and mineral. Minerals aren’t alive, and never have been: They’re inorganic. Diamond is a mineral. Other minerals are common table salt and the tiny quartz grains in beach sand. Every mineral is defined by the types and relative quantities of its atoms. This is called chemical composition. It’s also defined by the arrangement of its atoms-its structure-which is usually orderly and predictable A chemical element is a substance that consists of only one kind of atom. Diamond, is made of carbon. It’s the only gem made of a single element. Diamond is the only gem made of a single element: carbon. Diamond is typically about 99.95 percent carbon. The other 0.05 percent can include one or more trace elements, which are atoms that aren’t part of a diamond’s essential chemistry. Some of them can influence its color or shape. Formation conditions also help determine a mineral’s identity. Diamond forms under high temperature and pressure conditions that exist only within a specific depth range beneath the earth’s surface. Graphite, like diamond, contains only carbon, but its formation process is very different. The result is that graphite is so soft that you can write with it, while diamond is so hard that you can only scratch it with another diamond. Without any one of these factors, diamond might be just another mineral. Fortunately, though, the magic combination of composition, structure, and formation gives diamonds the qualities that make them extraordinary. Gemstone value is based on a combination of features, sometimes called value factors. As with other gemstones, diamonds with certain qualities are more rare, and more valuable than diamonds that lack them. Without a systematic way to evaluate and discuss these factors, there would be no way to compare one diamond to another. Diamond professionals use a special set of four value factors to describe and classify diamonds: clarity, color, cut, and carat weight. These are known as the Four Cs. When used together, they describe the quality of a finished diamond, which is directly related to its value. Most diamonds have yellow or brown tints. Absolutely colorless diamonds are extremely rare and valuable. The Four Cs describe the qualities of a diamond in very precise terms. They’ve become an international language that jewelry professionals can use to describe and evaluate diamonds. And they have a long history. Three of them-color, clarity, and carat weight-were the basis for the first diamond grading system established in India over 2,000 years ago. Cut wasn’t important then. For one thing, nobody knew how to shape and polish a diamond. They might have been able to split one by striking it, but this wasn’t a common practice. Fortunately, that has changed. Modern cutting brings out the best in a diamond. Today, cut is an important factor in determining a diamond’s value. Inclusion: Clarity characteristic totally enclosed in a polished gemstone or extending into it from the surface. Blemish: Clarity characteristic that’s confined to the surface of a polished gemstone. Few things in nature are absolutely perfect. That’s as true of diamonds as anything else. Diamonds have internal features, called inclusions, and surface irregularities, called blemishes. Together, they’re called clarity characteristics. Clarity is the relative absence of inclusions and blemishes. Inclusions will have a greater impact on a diamonds value than blemishes, because blemishes are confined on the surface and can be easily polished away. They help gemologists separate diamond from simulants. Inclusions in diamonds often have a different appearance from inclusions in simulants. 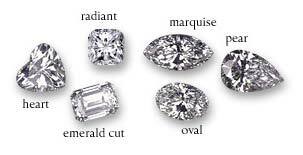 Because no two diamonds have exactly the same clarity characteristics, they can help identify individual stones. They provide scientists with valuable information about how diamonds form. (F) Flawless – These diamonds show no blemishes (external) or inclusions (internal) when examined under 10x magnification. (IF) Internally Flawless- These diamonds show no Inclusions (Internal) and only insignificant blemishes ( External) when examined under 10x magnification. 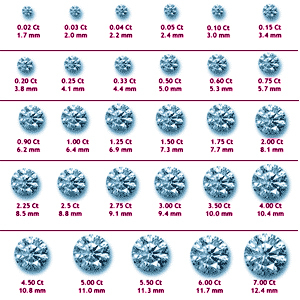 (VVS1-VVS2) Very Very Slightly Included – These diamonds contain minute inclusions that are extremely difficult (VVS1) or difficult (VVS2) locate under 10x magnification. (VS1-VS2) Very Slightly Included- These diamonds contain minor inclusions ranging from difficult (VS1) to somewhat easy (VS2) to see under 10x magnification. (SI1-SI2) Slightly Included- These diamonds contain Noticeable inclusions which are easy or very easy to see under 10x magnification. In some SI stones inclusions can be seen without magnification. (I1-I2- I3) Included – These diamonds contain inclusions which are Obvious to see under 10x magnification. Can often be seen face up with the un-aided eye. Also known as imperfect or Pique (Peekay). There is a strong relationship between clarity, rarity, and value. Flawless diamonds are many times more valuable than diamonds with just one or two clarity characteristics. That doesn’t mean that there is something wrong with SI or I diamonds. There is a huge market for them, SI diamonds are the most common and best selling diamonds in retail stores. Because even though SI diamonds may have some inclusions they may not be seen without magnification just like the better grades. Inclusions make a diamond unique and affordable. The world’s first system for grading diamond color dates back to sixth-century India. The system was based on the country’s ancient class structure. Members of different castes were permitted to own and wear only diamonds of a specific color. Thus, diamonds served as a badge of The priests and rulers, the Brahmins, were allowed to own diamonds that were “whitest of the conch, of the lotus, or of the rock crystal” (white to colorless). The landowners and warriors were assigned diamonds that were “the brown color of the eye of the hare.” The merchant class was allowed to own only diamonds that were the “pretty nuance of a petal of a kadi” (yellow). And members of the lower classes were assigned diamonds with “the sheen of a burnished sword” (gray or black). Kings, however, were free to possess diamonds of any color. Fortunately, diamond color grading has evolved a lot since that time. Today, there are well-established methods for judging diamond color. People outside the diamond trade often misunderstand the relationship between diamonds and color. Many people think of diamonds as colorless. In reality, truly colorless diamonds are quite rare. Most diamonds used in jewelry are nearly colorless with yellow or brown tints—most often light yellow. The variations in color can be very subtle. Diamonds come in many colors other than yellow and brown. Some of the most rare colors are red, purple, and green. With colored diamonds, more color usually means higher value, so the brightest, purest colors are the most desirable. Size makes a difference in a diamond’s color—the big­ger the diamond, the more obvious its color. The differences in color can be subtle, but they can cause dramatic variations in price. Normal color range. Within the normal color range, colorless diamonds are the most rare, so they’re the most valuable. They set the standard for grading and pricing other diamonds in the normal color range. Subtle differences in color can dramatically affect the value of a diamond. Two diamonds of the same clarity, weight, and cut can differ in value based on color alone. Even the slightest tint of color can make a dramatic difference in value. The GIA D-to-Z scale is the industry standard for color-grading diamonds. Each letter represents a range of color based on a diamond’s tone and saturation. The GIA Color Scale describes the normal color range from D (colorless) to Z (light yellow or brown). Today, the GIA Color Scale is the most widely used diamond color-grading system in the world, and the normal color range of diamonds is often called the “D-to-Z scale. They are yellow or brown diamonds that have more color than a Z masterstone. Blacks and grays are considered fancies, too. Some have been fashioned into gems. The 67.50-ct. Black Orloff diamond is the most well known example. Natural fancy colored diamonds sell at significant premiums to normal color range diamonds because of their rarity. Today it is possible to alter the color of diamonds using science., using processes as Irradiation and HTHP (high temperature high pressure) humans can alter the color permanently of diamonds. However they are not considered natural fancy diamonds and command less expensive prices than natural fancies. There was a time when people believed that diamonds had magical qualities. They thought that rough diamonds had the power to ward off evil spirits, cure all kinds of ailments, and make the wearer as indestructible as the gem. They also believed that altering a rough diamond took away those powers. When people became less influenced by magic and superstition, diamonds began to lose their appeal. After all, other than perfectly formed octahedrons with clear, glassy surfaces, diamonds aren’t very attractive in their rough state. The irregular surfaces of most rough diamond crystals hide their wonderful optical qualities. Things began to change in the fourteenth and fifteenth centuries, when polishing techniques began to develop in India and Europe. While they still hadn’t found a way to shape a diamond, the earliest polishers dis­covered that they could use diamond powder to remove roughness and make the natural surfaces more transparent. They called the resulting polished octahedrons point-cut stones. In the sixteenth century, polishers were able to shape a diamond by grinding away the upward-facing point, creating a flat table facet. The result was called a table cut. In the early seventeenth century, the grinding process advanced a little further: Polishers used it to create rose-cut diamonds, with flat bottoms and faceted tops that came to a point. While this process did produce a more finished-looking diamond, it resulted in the loss of a lot of the original rough’s weight. People began to split, or cleave, diamonds in the seventeenth century. At last, they were able to derive a basic shape from the rough before polishing. Because they no longer had to grind a diamond down in order to shape it. this resulted in less weight loss. The rotary diamond saw. introduced around 1900, and lasers, intro­duced in the 1970s, give modern cutters an even greater ability to shape rough diamonds into glittering gems. Modern diamond cutting consists of three or four steps: cleaving or sawing (splitting the rough crystal), bruting (marking the girdle or the diamond), and polishing ( polishing the facets into the diamond ). A well-cut diamond can make light perform in breathtaking ways, resulting in a magnificent display of three important diamond attributes: brilliance, fire, and scintillation. Brilliance is the combination of all the white light reflections from the surface and the inside of a diamond. It gives a polished diamond its brightness. Fire is the word for the flashes of color you see in a polished diamond. Scintillation describes the flashes of light you see when the diamond, the light, or the observer moves. 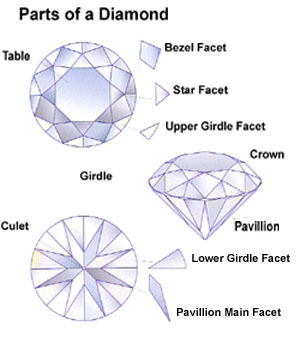 The three major parts of a polished diamond, top to bottom, are the crown, the girdle, and the pavilion. The crown and the pavilion—and sometimes the girdle—have small, flat, polished surfaces called facets. Some polished diamonds also have a flat facet at the bottom of the pavilion, called the culet. This basic information will help you throughout the rest of this guide. Proportion refers to the angles and relative measurements of a polished diamond. More than any other feature, proportions determine a diamond’s brilliance, fire and scintillation. Studies have shown that table size, crown angle, and pavilion depth have a dramatic effect on a diamond’s appearance. Proper round brilliant cut (Ideal or Premium). Light enters the diamond from the to reflects internally bouncing from facet to facet and exits the diamond only through the top giving maximum light return and brilliance to the viewer. Improper cut diamonds are sometimes cut wide to retain maximum weight from the rough crystal resulting in a heavier carat weight but will sacrifice light return. When a diamond is cut too deep to retain weight, you can see that the light enters through the top but exits out of the side not retuning to the viewer this will result in a large dark spot in the diamond called a “Nail Head” and make the diamond look dark. The first is the precision with which diamonds are weighed. Diamond weights are stated in metric carats, abbreviated “cts.” One metric carat (abbreviated “ct.”) is one-fifth (0.200) of a gram—just over seven thou­sandths (0.007) of an ounce. One ounce contains almost 142 carats. The metric carat is divided into 100 points. A point (abbreviated “pt”) is one hundredth of a carat. An easy way to remember this is to think of carats as dollars and points as pennies. They’re even written the same way: $1.34 means one dollar and 34 cents, and 1.34 cts. means one carat and 34 points. Diamonds are weighed to a thousandth (0.001) of a carat and then rounded to the nearest hundredth, or point. Fractions of a carat can mean price differences of hundreds—even thousands—of dollars, depending on the quality of the gem. The second aspect of carat weight that surprises people is the relationship between rarity, weight, and value. People expect a pound of sugar to cost twice as much as a half pound of sugar. But diamonds aren’t sold like sugar. Their prices depend on a number of variables—weight is just one of them. So it’s not always easy to understand, or explain, why a 1.00-ct. diamond is worth, say, $6,000, while a 2.00-ct. diamond of similar quality might be worth $15,000. It’s really a simple concept: Large diamonds are more rare than small ones. You’ve already seen the relationship between rarity and value. The more scarce something is. the more it’s worth. So a larger stone doesn’t just cost more It also costs more per carat. A 1.00-ct. diamond weighs the same as four 0.25-ct. diamonds. But even if all the other quality factors are equal, the larger diamond is worth much more than the sum of the four smaller diamonds. Carat weight can also be symbolic. While the difference between a 0.98-ct. diamond and a 1.01-ct. diamond is almost invisible, many people will choose the larger stone—even at a much higher price. Don’t confuse the term carat with Carat. Karat is a unit of measure that describes the purity—or fineness— of gold.